Will the McDonald’s 24-Hour Breakfast Experiment Hurt Dunkin’ Donuts? McDonald’s is testing an all-day breakfast menu at select locations in San Diego this spring. The fast-food chain has tried all-day breakfast experiments as early as 2006, but keeps running into problems, so whether the experiment becomes a permanent fixture remains to be seen. 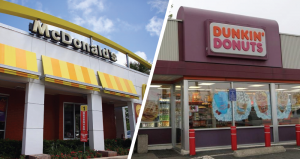 But in a hypothetical world where McDonald’s finds a way to offer an all-day breakfast menu, what would that mean for Boston’s favorite fast-food breakfast franchise: Dunkin’ Donuts?